Destination Costiera Amalfitana – Naples and Positano – Travel. Eat. Repeat! Imagine paradise. You might as well be imagining the Amalfi Coast in Italy. One of the most beautiful places on Earth. There is so much to talk about when it comes to the Amalfi Coast. I will have to break this into a few posts in order to really dive into each town. We will cover Naples, Positano, Praiano, Amalfi and Capri. On this post, let’s focus on Naples and the must see places on your way to Positano! As you arrive in Naples – Napoli in Italian – make sure you have your transfer set up to go to the Amalfi Coast. If you are planning on taking public transportation, you can take a bus from the airport to Sorrento, and from there take a bus your destination. Click here for a map of the airport and bus terminal. The bus to Sorrento is the Curreri located in the blue terminal. From Sorrento, take the Sita bus to Positano. Bus tickets are sold at “tabaccherie” (cigarette shops), newspaper stands, and bars and caffés in all the towns along the Amalfi Coast. In Sorrento, there is a ticket booth at the Circumvesuviana station. Tickets CANNOT be purchased on board the bus. For more information, click here. I advise booking a car service that will take you to the Amalfi Coast in about 1 hour. The best limo company in the area is called Benvenuto Limos . Their chauffeurs have an extensive knowledge of the region and the customer service is impeccable. Depending on the season, you may want to plan this as much as a couple months in advance. You cannot visit Naples without eating some of its famous “Pizza Napoletana”! One of the local’s favorites spots is Pizzeria Gino Sorbillo located along the coast at Via Partenope. There you will get to eat fabulous pizza, while enjoying a gorgeous view from the Naples bay. There are many beautiful sites to visit in Naples. You should not miss taking a stroll down the Naples Bay. You must visit Piazza Municipio and the Cathedral of San Gennaro . The cathedral is the main church in town in honor of Saint Januarius, or San Gennaro, the patron saint of Naples. If you are feeling adventurous, you may want to consider renting a car that will allow you to explore more of this beautiful area. A 30 minute drive to Caserta is in order to try the best pizza in the area! It is called Pizzeria I Masanielli, located at Viale Douhet, 11, 81100 Caserta. It does not have a website but trust me on this one! As you make your way to the Amalfi Coast, I suggest a quick stop at a local deli that you will forever remember. It is called La Puteca di Masaniello in Piano di Sorrento. This is a local salumeria where they make most of everything in house. I have never gone to the area without stopping for some delicious snacks, breads and cuts at La Puteca. There are times I catch myself day dreaming about all of the delicious breads, cheeses and cold cuts. Their address is Corso Italia, 296, 80065, Piano di Sorrento. As you keep making your way to Positano, you will drive through the famous Costiera Amalfitana, where the roads are narrow. There is only one road, where traffic goes both ways and often when there is a bus coming in the opposite direction, only one car can pass at a time. Do not be shocked if you see many cars having to back up so the bus can go around a sharp curve. Driving in the Costiera Amalfitana is not for the faint of heart so think twice before that rental car! Next stop: Positano! It is approximately 1 hour drive from Naples (depending on your stops along the way). It is the most gorgeous town, famous for its Cliffside real state and the delicious restaurants and cafes. One of the most beautiful hotels in the area is Le Sirenuse. Go for a drink on the terrace bar, or if you’re lucky, stay there for a few nights – it is a bit pricey but what an experience! Whichever you decide to do, make sure you find some time to go in and explore the hotel. 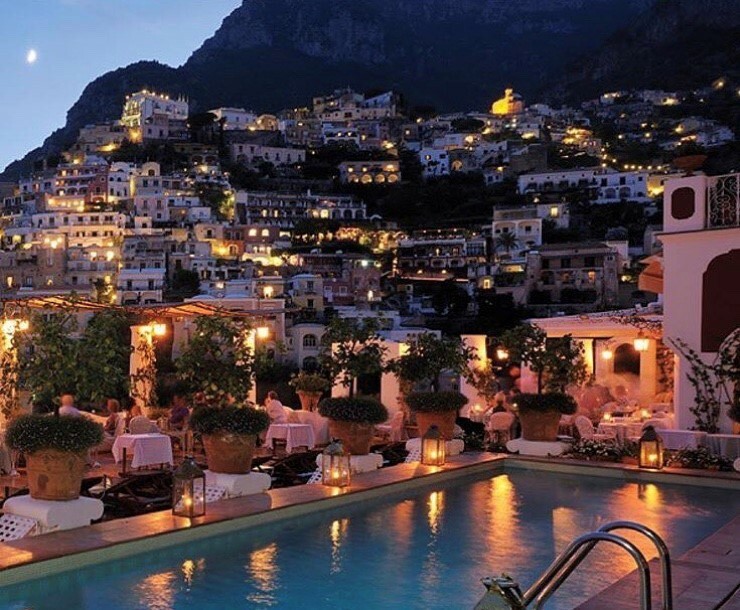 The Le Sirenuse Hotel is around the main shopping area in Positano. There are many little shops, arts and crafts, cafes and boutiques you will want to visit. Ceramics are a very traditional gift from the area, and in Positano you will find everything from little mugs, jars, salt and pepper shakers, to full table settings. All of the ceramics are made and painted in the region and some can me made to order. I would suggest packing light on your way to assure you will have enough room in your suitcase to bring back some mementos. When you think of Amalfi Coast, you immediately think “lemons”. You will try more limoncello there than anywhere else in your life. If you have never tried it, limoncello is a delicious lemon liquor served after every meal. You are allowed to bring up to 2 bottles back to the US so chose wisely. Dress very comfortably. The streets in Positano are mostly cobble stones and stairs are everywhere. Yes, during your visit you will go up and down hundreds of steps… a day! No wonder the locals stay fit, even after eating all the amazing food. So do yourself a favor and do not wear heels! 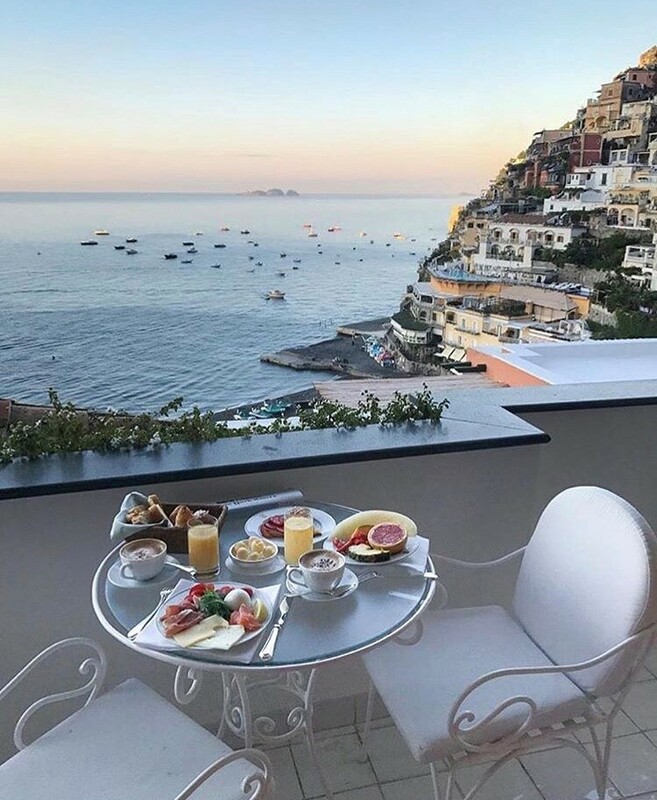 There are many restaurants I recommend in Positano. I will mention 2 of my favorites. The first is a family owned restaurant, Fattoria La Tagliata. They grow their own vegetables, have their own lemon garden and not only is the food phenomenal and all home made, you will be blown away by the view! The home made mozzarella and their meats (yeah, the steaks!) are also something you must try. Another one of my favorites restaurants in Positano is La Taverna Del Leone. The entire meal from start to finish was to die for and everything was delicious. You probably should make a reservation if you want to dine there, especially if you are going during the peak season – which starts in May and goes until end of August. Now let’s talk fun: you cannot miss this one! On any given sunny day in Positano, which is basically every day, you have to schedule a visit to “One Fire Beach“. Let me start by saying it is not really a “beach” but an experience. 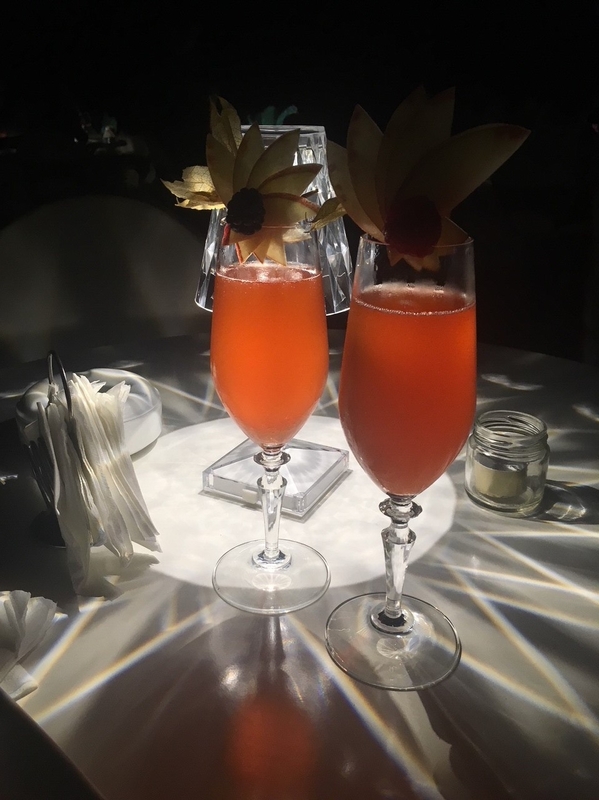 You will have the best time there while having delicious cocktails. I recommend the Aperol Spritz – the traditional Italian aperitif – or just a chilled bottle of wine. The food is super fresh, the fish and shell fish are brought daily by the fisherman… it doesn’t get much better than that. Oh wait, but it does. At 4:30PM every day, it’s “MELON TIME’! The music pumps up and before you know it the crowd is on their feet, dancing and clapping while several enormous watermelons get chopped and distributed to everyone on the beach. That means the party has started! I hope you have enjoyed the first part of the Costiera Amalfitana destination post. I have been there so many times, and I will never get tired of going back. There is so much to see, so much to do and I wish I could share each and every little detail here! I am sharing with you the highlights of the area and hopefully this will excite you to pack your bags and book your trip! Ciao! I blog about luxury travel, dating, relationships, beauty and Tech on Sundays. BEAUTIFUL, we have been there repeatedly and you are right ITS FANTANSTIC ANYTIME!!!! Thank you for checking out the post Colomba! I am so happy you liked it, especially since you have visited the area. Pingback: Costiera Amalfitana Part 2: Praiano – Travel. Eat. Repeat. Que bom que voce gostou!!! One of the most beautiful destinations in the world!!! Glad you enjoyed it! Keep checking back for more travel tips. Part 2 is live with awesome tips on my favorite: Praiano! Wonderful post about my homeland!!! 😍💜 My dad worked for years as Maitre d’ hotel at the restaurant of Le Sirenuse!! OMG i did not see the pizza dough recipe yet!!!!!! Thank you so much for telling me! I still have to sit and dissect your blog going through each recipe. I cannot wait!!! Previous Must Go in Miami Beach!